Closing your eyes and still seeing the palm trees, feeling the breeze going thought your hair and smelling the sea you know that the last holidays were the ones you will remember for a long, long time. Especially, if your holiday destination was Hurghada in Egypt. Then the memories of it will be remembered for the rest of your life, but of course if you are not a picky traveller. Arriving to Hughada airport at midnight, sleepy and tired from the stressful everyday life, you sit on the bus that will take you to the hotel. After the first few minutes of driving on the bus you are shocked when you realize that your bus is accompanied by military vehicle with armed soldiers. The shock does not stop here. Arriving at the hotel they kindly take your luggage and scanned it and you have to go thought a scanner, just like at an airport. Coming from a safe country like Slovenia, where you can hardly ever see a soldier, this was really an unwanted experience. However, throughout the week you get used of armed soldiers scanning you at every entrance and exit of the hotel because you understand that they are here for your safety. 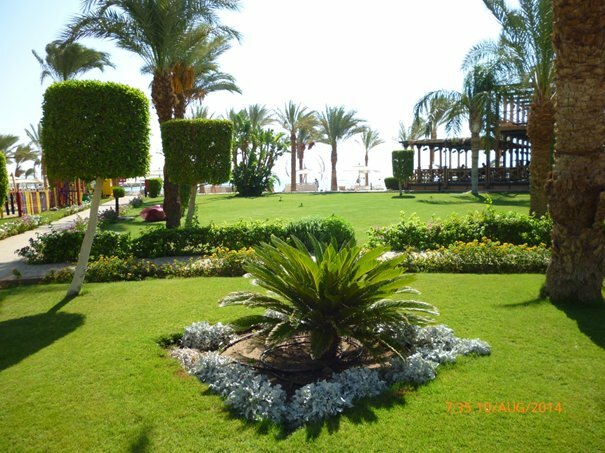 After a good sleep in the hotel room you wake up to a breath-taking view of perfectly green grass that is surrounding the palm trees. At this point you go explore your hotel room in a four star hotel. It had everything you need for the holidays; a bad to sleep, a bathroom with a hot water shower and it was clean. If you expect from a four star hotel in Egypt anything more from that you will be disappointed. Every morning they cleaned the room and give two bottles of water since the water in Egypt is polluted and can cause different diseases if you drink it. 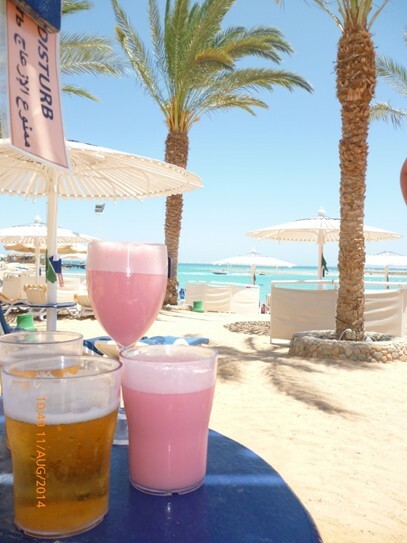 By now you are probably wondering what is the beach like in Hurghada. What can I say, it is dreamlike. It has hot sand, deck chairs whit sunshades and all inclusive bar on the beach. In august the temperature of the sea was around 30 degrees Celsius and the temperature of the air was around 42 degrees Celsius at day. In spite of that, you do not have the feeling that is actually that hot because of the constant breeze. So perfect weather to lie under the palm trees and relax. However, that is a perfect plan for the first two days; then you must go explore Hurghada a little bit unless you will be sorry. 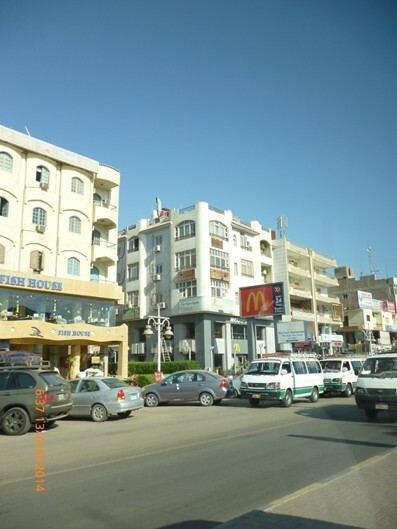 One of a must visit place in Hurghada for women is the Sheraton street. You can go there by taxi that are really cheap, but don’t forget to arrange the price of the drive before you sit in the taxi. If you do not do so, it can be expensive. While driving to Sheraton street you can see that Hurghada (actually this is true for most of Egypt) is a city of opposites. By the sea you have new hotels; just a minute of drive away you see buildings for which you cannot really put a finger on if they were demolished or just never actually finished up building them. Nevertheless, the ravages of time have left a mark on them. You can also observe that around the Sheraton street, where the surroundings are also demolished. Putting aside the visual aspects of Sheraton street, this is shopping paradise for everyone who wants to buy prestige brands by very low prices; probably I do not have to point out that these are not authentic brands. Furthermore, if you are not the type of person who would spend their holiday shopping, Hurghada offers many other activists. One that you cannot miss on is snorkelling on the coral reef. Many hotels in Hurghada promote that they have their own coral reef. Nevertheless, to experience the real coral reef you have to go on a boat trip to the open sea, where really enormous and beautiful coral reefs are. One possibility is a boat trip from Hurghada port to coral reefs. 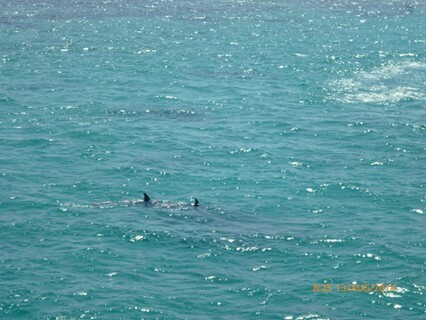 If you get lucky-and we did- you will see dolphins along the way. Yet if you are not as lucky as we wore, and you don’t see dolphins you can later on still snorkel among colourful fishes that live around the coral reefs. The experience to swim by the coral reefs among this colourful fish in a crystal clear water is unforgettable and not to be missed out when visiting Hurghada. Hurghada offers many other interesting trips like visiting the safari with four-wheeler, having diner whit Bedouins on their traditional way or visiting Luxor and pyramids in Giza. Still, seven day holiday are not enough for this if you also want to relax. Concerning people that I meet in Hurghada I cannot find a single harmful word to say about them. It was interesting how the hotel staff is only men, from the bartenders to the cleaners. They were all kind to us; most of them also speak English, so there was no trouble to communicate with them. Just an advice, do not joke about how much camels you would switch for your wife or girlfriend since they this very seriously. 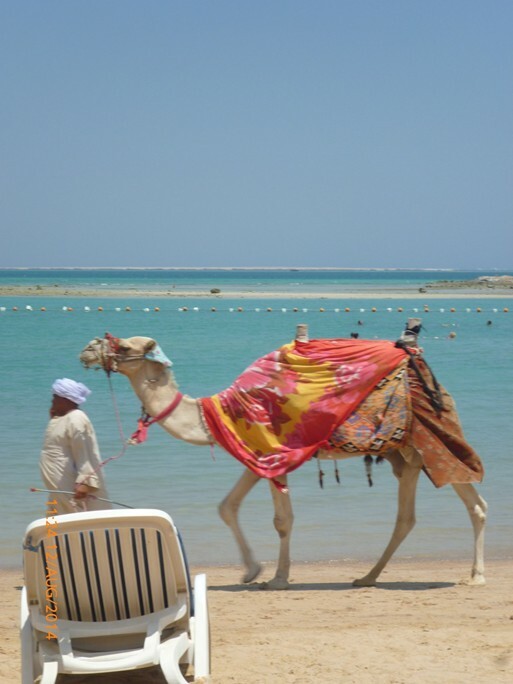 To sum it up, Hurghada has stunning beaches, kind people and many places you can visit between your holidays there. What makes Hurghada even more appealing is the fact that the prices are low and the weather is hot all year around. However you put it, I would not have to think twice to decide if I want to go to Hurghada once again.